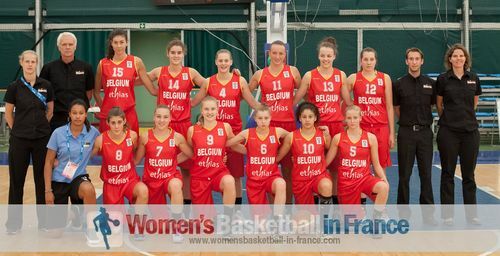 The first round of the 2013 U16 European Championship for Women has ended in disappointment for the hosts Bulgaria, Lithuania and the Slovak Republic with their elimination from the title race. The 12 teams that have qualified for the second round will compete over three days divided in two groups (E and F) of six teams. At the end of the second round, the top four teams advance to the European Championship quarter-finals, while the rest has to play to avoid relegation. The four teams eliminated during the first phase are put into Group G for a round robin league phase in which they play each other once. The four teams are then reintegrated into the 9th -16th classification round with the four teams that fail to qualify for the quarter-final. Bulgaria came into their final Group A game against Croatia knowing that a victory could take them into the Second Round. Croatia did not allow Bulgaria a chance. Leading (11-0) after five minutes the suspense was over. Croatia dominated the first quarter (26-5) and then paced themselves the rest of the way for a comfortable victory (73-39). Iva Slonjsak from Croatia who scored 11 points in the first quarter finished the game with 15 points, 9 assists and 6 rebounds. Spain maintained their unbeaten run with a (60-40) victory over Greece. With Bulgaria losing, Greece have qualified for the second round. Although it was not a smooth performance by Spain but the 18 points by Angela Salvadores and a double-double of 13 points and 12 rebounds by Cecilia Muhate, they always had the edge. In Group B, Sweden, already eliminated, gave Russia a scare leading (20-9) at the end of the first quarter. Russia stepped up defensively during the second quarter and reduced their deficit to a single point (30-31) at the break. In the second half Russia fought more offensively to open up a double-digit lead (47-36) midway through the third quarter. They remained in front for the rest of the game. They ended up winning (67-56) and will start the second round with a perfect record. Latvia beat Turkey (51-26) with the Stautmane sisters, Digna (20 points) and Paula (16 points, 14 rebounds and 8 assists) doing most of the damage. Belgium had no choice but to win their last Group C encounter in Varna to stay in the competition. So their victory against the Netherlands (46-41) was celebrated as if they had become European Champions. The game itself was not very good technically. But Silke Lenssens from Belgium who was the only player in the match with a double digit score with 13 should not mind. The players from the Netherlands were almost in tears after their defeat. However they finally found their smile when Italy eliminated Lithuania (57-35) in the last group game. In Group D, France dropped from first place to third after losing (36-56) to Hungary. France looked good for two minutes leading (5-0) and then it was over. Hungary scored the next 13 points and never trailed again. Nina Aho and Eniko Kutto scored 14 and 12 points each for Hungary that moved into first place. If the Slovak Republic had beaten the Czech Republic they would have qualified for the second round. Yet the Czech Republic did not hang around for long leading (10-2) after four minutes. The Slovak Republic had no answer for Julia Reisingerova who finished with 16 points and 9 rebounds as the Czech team cruised to victory (65-44). France, the Czech Republic and Hungary all go into the second round with identical records of 1 win and 1 loss.